Posting these frosty Christmas cards for the Crafty Individuals challenge (Frosty Christmas), the Craft Barn weekly challenge (Snowflakes) and the SimonSaysStamp Wednesday challenge (Anything goes). I used a torn piece of paper to mask the snowy ground, and stamped Mini Christmas Trees with different shades of blue (and three generations of stamping to give depth). 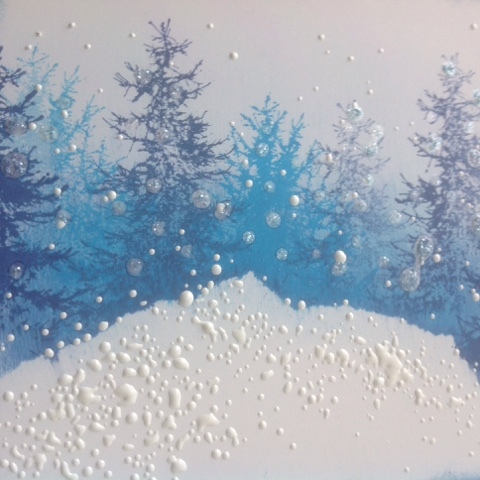 I wasn't really happy with my ground, on one there was too much, and on the other one perhaps too little :) I love the effect of the Stampendous chunky white embossing enamel... giving texture and interest and a snowfall feeling to the piece. If you look close, you might spot some Stickles too! 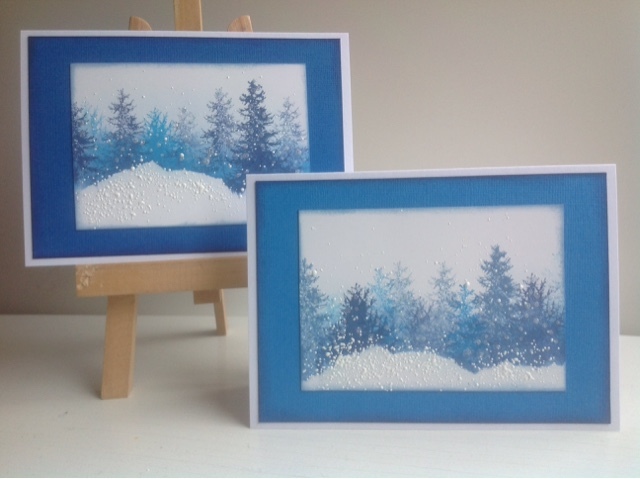 Wonderful winter trees cards Kristiina, perfect for Chrismas and for the CI challenge! Thanks for joining in. Beautiful scenes! You truly created a winter frost appearance. Thank you for joining the Crafty Individuals challenge. Fabulous! Love the effect you have created with the chunky white embossing. Thank you for playing along with the Crafty Individuals Challenge. Wow! Beautiful blue and white winter trees. I am also a fan of the Stampendous embossing enamels but have not tried the chunky white yet. It looks great, I must get some! The colours are beautiful and I really wish Christmas this year will look like this. Just lovely!! Thank you for entering The Craft Barn Challenge.